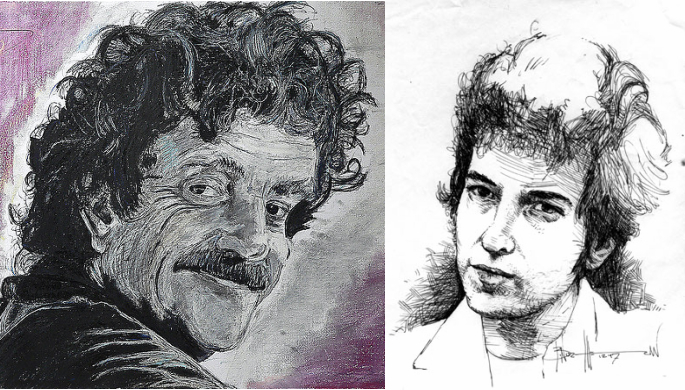 Kurt Vonnegut on Bob Dylan: He "Is the Worst Poet Alive" | Open Culture Kurt Vonnegut on Bob Dylan: He "Is the Worst Poet Alive"
Vonnegut is one of the great American pop writers of the last half of the 20th century. Bob is the most influential artists of the second half of the 20th century. If not Bob, who? Difficult to tell how good a poet one is by the songs they write. Entirely different disciplines. In song, the writer needs to make space for the music and melody. In poetry, one uses (and counts on) the silence. The way the words (sounds, syllables) are allowed to breathe within the open air of poetry, is very different than the confines and business (read: busy-ness) of lyric writing. For instance, I fell in love with Leonard Cohen’s poetry, long before I paid any attention to (or even knew about) his folk career. And in doing so, I must admit, I don’t care for 90% of his songs. They, to me, lose something. I’ll take a concise, biting, revelatory five-line gem of poem over almost any song of his any day. And I’ll add that I’ll agree with Vonnegut in this sense; Dylan was more than willing to use lazy rhymes and gibberish to eventually get to a pay-off, as (or more) often than he was efficient, dense. or consistent in the quality of his lines. I pity someone who dismisses songs like It’s Allright Ma (I’m Only Bleeding) as gibberish, he surely misses out on something. I have read a lot of poetry, but that song for me tops anything that is written. I well recall settling into my 14th row seat at Madison Square Garden in December 1976 for the Hurricane Carter benefit show put on by Bob’s Rolling Thunder Revue, when my brother told me to look to our right and there was Kurt Vonnegut sitting next to us. As much as I appreciate and respect the work of Kurt Vonnegut, I would not go to him for music recommendations. The Statler Brothers?